Sometimes, a hotel room is a necessity. I am blessed to have friends who don't mind my dropping in to stay overnight as well as family located in places I want to visit. When Carole and David moved her cross-country, they slept in the back of her Jeep Cherokee. Fold down the rear seat and sleep on the futon mattress. If you camp or own a trailer, your lodging goes with you. I camped for a number of years with my family and with church groups. I'm not a camper, although there is something magical about a tent and a campfire on a summer night. Carole got a great deal at the Comfort Inn in Warrenton for anyone who needed to stay for her wedding. It was $89 a night. We got two beds, a wardrobe, a nice big bathroom, a fridge, ironing board, iron, hair dryer, microwave, a flat screen TV, wake up service and quiet. We didn't bring that much with us but I took the side close to the windows while mom took the side close to the fridge. She sometimes gets late night cravings so this way, she could get her yogurt from the fridge without waking me. It was a room, utilitarian, met our needs at a good price. We split the cost so it was very reasonable. On Sunday, we traveled part of the way back to April and Perry's. We could have driven the whole way back but I wasn't expecting the trip to be quite as quick as it turned out to be. We stayed at a Fairfield Inn in Morgantown, West Virginia. Very different decor. It cost us more. It was a much newer hotel. My mother loved the decor. I thought it a bit garish. I should have taken a photo of the carpet in the hallways. Different. Some time ago, I mused about how we don't celebrate all jobs equally. 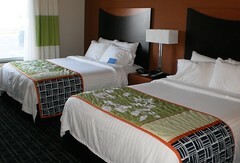 I thought about that when we would return to our Comfort Inn room to find the beds made and the bathroom tidy. It takes people to clean rooms. We've all heard the stories of celebrities trashing hotel rooms. Someone has to come in and clean that up. Those "someones" are probably making minimum wage. While this was my home away from home for 3 days, I still don't own it. I wouldn't dream leaving the kind of mess in a hotel room that I might at home. I toss my pjs on the bathroom scale at home. I put them in my suitcase in the hotel. I feel badly when I don't realize the shower curtain is outside the tub and water gets all over the floor. Mom has a different perspective of hotel rooms and the staff it takes to keep them nice. She used to clean rooms for a hotel in Marquette, Iowa. It's hard work and you can find all sorts of messes as well as lost items. She was grateful when someone left a tip. We don't think about tipping those people rolling their carts down the hallway. I try to tip a couple dollars a day when I stay, although in West Virginia, I was out of paper money. I wouldn't dream of treating cleaning personnel with disrespect. Someone has to come in an clean my room. Would I stay in a room that wasn't cleaned? Not at all. This is their job. It's demanding. It can be difficult, but it's necessary. There would be no hotels if there wasn't staff and it's a hard job to fill. So, I'm putting a bug in your ear to remember the next time you stay at a hotel, leave a buck or two for the person who cleans your room. It's a tiny way to say you appreciate them and the job they do.